We want to thank each of you for sending letters a few weeks ago to get AB 2514 (Thurmond) out of the Senate Appropriations Committee. Our voices were heard and the bill passed out of committee unanimously with a bipartisan vote. Your help is now needed to convince Governor Brown to sign AB 2514 (Thurmond) Dual Language Grant Programs into law. AB 2514 (Thurmond) proposes to provide up to $300,000 in grant funding to eligible schools, county offices of education and consortia so they can either expand or initiate new dual language immersion or developmental bilingual programs. What’s exciting about this bill is that grant funding would also be given to eligible schools, county offices of education, or consortia interested in establishing bilingual programs for their dual language learners in preschools! Although no funding was allocated in this year’s budget, the signing of AB 2514 by the Governor will allow us to pursue funding next year in the 2019-2020 state budget. The bill is very clear in stating that its provisions will not be implemented if no funding is appropriated. Letters must be sent to Governor Brown to convince him that the public and members of the education community seek his support to keep the promise of Proposition 58 by promoting and supporting dual language immersion and developmental bilingual programs. Your help is needed in convincing members of the Senate Appropriations Committee to allow AB 2514 (Thurmond) Dual Language Grant Programs to continue its way through the legislative process! 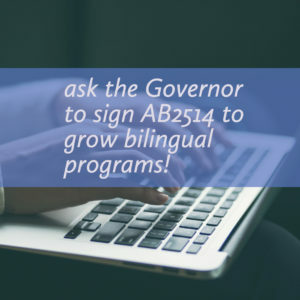 AB 2514 (Thurmond) proposes to provide up to $300,000 in grant funding to eligible schools, county offices of education and consortia so they can either expand or initiate new dual language immersion or developmental bilingual programs. What’s exciting about this bill is that grant funding would also be given to eligible schools, county offices of education, or consortia interested in establishing bilingual programs for their dual language learners in pre-schools! The problem is that specific funding for this grant program was not provided for in the 2018-2019 State Budget. HOWEVER, moving AB 2514 through the legislative process will allow us to pursue funding next year in the 2019-2020 state budget because the bill is very clear in stating that its provisions will not be implemented if there is no funding appropriated for its provisions. Letters must be sent to the Senate Appropriations Committee to convince them that the public and members of the education community seek the legislature’s support in keeping the promise of Proposition 58, promoting and supporting dual language immersion and developmental bilingual programs by removing AB 2514 (Thurmond) off the “Suspense File” so it can continue its way through the legislative process. We need 3 minutes of your time for the following 2 alerts. You must respond to each no later than Sunday May 21st, 2018. Your voices will make a difference. This letter to Assembly Member Kevin McCarty and Assembly Member Philip Ting request the inclusion in the 2018-2019 State Budget, start-up funding for school districts and consortia’s for the purpose of establishing new or expanding existing dual language immersion or developmental bilingual programs or establishing early learning bilingual programs for our young dual language learners. Click here to send it to your Legislators, you will be able to sign and send your letter NOW! Your letter to the Chair of the Assembly Appropriations Committee, the Honorable Lorena Gonzalez Fletcher is needed to move AB 2514 (Thurmond) off the Assembly Appropriations Suspense File to the full Assembly for a vote. Click here to send your letter! Help Support Our Dual Language Immersion and Bilingual Programs PreK-12th grade! 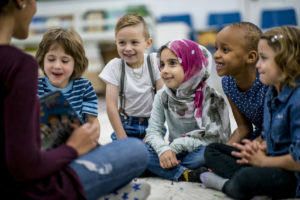 There is an opportunity to provide “seed” and “capacity building” funding to our school districts seeking to expand existing dual language immersion or developmental bilingual programs or to establish new dual language immersion or developmental bilingual programs or early learning dual language learner programs. AB 2514 (Thurmond) Pupil Instruction: Dual Language Grant Program was introduced by Assembly Member Thurmond on February 14, 2018. This bill is sponsored by CABE and Californians Together in response to feedback from educators that additional resources are required for our school districts to expand or establish new dual language immersion or development bilingual programs as called for in Proposition 58 of November 2016 and overwhelmingly supported by voters! The bill would also allow funding for early learning programs for our dual language learners in pre-school!! Establishes the 3 year Pathways to Success Grant Program proposing to provide up to $300,000 per grantee for a minimum of 10 grants. Allows local educational agencies or consortia to apply for this funding. 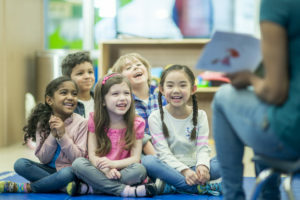 Funding can be used for purposes such as recruitment of bilingual teachers at the pre-school, elementary and secondary levels, on-going professional development for teachers, teacher coaches, establishment and support of language learning materials; instructional materials; and ongoing outreach to families and family engagement. Convening of grant recipients to share their program models, best instructional practices, curriculum, instructional materials and other resources. AB 2514 will be heard in the Assembly Education Committee on April 11, 2018. Click below to send a letter of Support Assembly Member O’Donnell, Chair of the Assembly Education Committee. All letters much be received by April 5th. Let’s implement the promise of Proposition 58, reaffirming the value of multilingualism and biliteracy! Let’s encourage and promote dual language immersion, developmental bilingual programs and early learning dual language learner programs NOW! Click HERE to send your letter to Assemblymember O’Donnell. The comments must be received by September 11, 2017 not later them 5:00 pm. Only if many comments are submitted will the State Board of Education consider modifying these draft regulations. Click, download, sign, scan and email this letter today. Yesterday’s announcement from President Trump putting an end to the DACA program reminds us why we are Californians Together. It reminds us not just in California, but across the country, why we stand together, why we work together and why we make progress together. We at Californians Together have heard from teachers and parents about the stress, fears and tension our students are experiencing. For many of our families DACA young adults are models for their younger siblings and have brought some stability to their family. Today, we wanted to start by sharing some of the words that we have heard from others, reminding us of what is at stake and why we must stand together – as some have pointed out, on the right side of history. So many organizations are standing together urging Congress to act. Here are three important bills that will need our support. Please take a few minutes to call or write your representatives in Congress or Senators Dianne Feinstein (www.feinstein.senate.gov/public/index.cfm/e-mail-me or (202) 224-3841) or Senator Kamala Harris (ww.harris.senate.gov/content/contact-senator or (202) 224-3553). The DREAM Act, to provide a path to citizenship for young immigrants who have graduated from high school, are pursuing higher education, or serving in the military. You can use these talking points. The BRIDGE Act, would provide employment authorization and protection from deportation for individuals who currently hold and are eligible for DACA. You can use these talking points. The American Hope Act would provide DACA students as well as other eligible young undocumented immigrants who were brought to America as children, with a permanent, legislative solution that allows them to stay legally in the United States. You can find talking points here.